I am currently loving the new trend of adult coloring books. As I have said in past reviews, I love to color and it's a great stress reliever. I do love the fact that a lot of the Christian publishers are embracing this trend and they are publishing wonderful devotional coloring books that can pull you closer to God all the while allowing you to express your worship in a new, creative way. 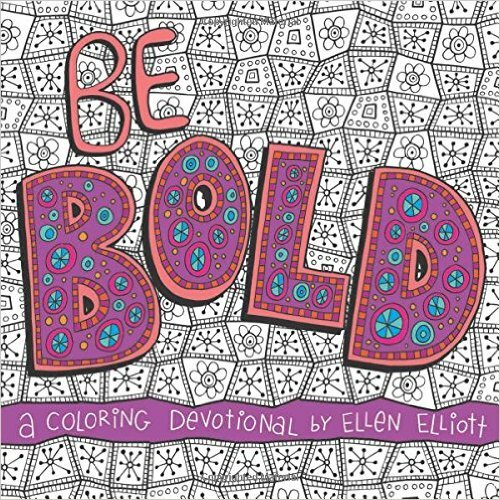 Be Bold: A Coloring Devotional by Ellen Elliott is an unbelievable addition to the adult coloring genre. Elliott has created an amazing devotional that couples 31 beautifully written devotionals with a gorgeous graphic to color. The devotionals are short and to the point, but I love that about them. They are rooted in scripture and relatable which makes them applicable to my every day life. The reason I love the short devotions so much is that it leaves me TONS of time to color the coloring page that goes with the devotional. Now, with most coloring books I have found that the pages just don't hold up to whatever coloring instrument I use. This is where this book is different...I tried EVERY type of medium and the pages held up to everything. None of the coloring instruments I used went through the pages. Having the pages think enough to use any coloring medium was a nice, thoughtful addition to this book. If you are looking for a new coloring book to take away the stress or connect with God, THIS IS THE ONE. It's amazing and I highly recommend it.